Crusader-Knight Update - Thursday Action! The Knight and Crusader basketball teams were all in action Thursday, along with the Varsity and JV Crusader wrestlers - here are the outcomes! Read more about Crusader-Knight Update - Thursday Action! An upset wasn't on the menu at the Tony's Pizza Event Center (The Big Pizza Oven) in Salina for sixth-seeded Wellington, losing 63-49 to three-seed Bishop Miege in the opening round of the 4A, Div. I State Championship Tournament. Wellington was unable to get a win against a very good Wichita Collegiate team. Eleven different Spartans scored in the 21 point win in Wellington on Senior Night. The Crusaders came out of the gates firing, Ian King gave Wellington an early lead with the first two field goals of the evening, Wellington was up 4-3 early. King would go on to lead all scorers in the game with 21 points. It was a very fast-paced first quarter, and WHS battled hard against one of the top 4A Div. II teams in the State. Wellington's girls basketball team took care of business at during the last home game of the season Feb. 24, downing Wichita College School 51-22. Tayland French wasted no time getting Wellington on the board. After a steal, Avery Rusk put in a layup. Another steal lead to a quick, Lauryn Snipes bucket. It was an early 6-0 hole for the Lady-Spartans, who were forced to call a time out with 6:21 left in the first, down 10-3. Wellington scored on their first five possessions, four of those baskets off of turnovers. 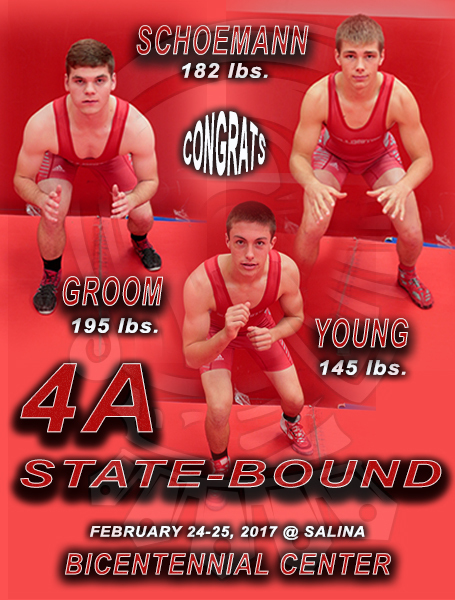 "3" CRUSADERS HEADIN' TO STATE 4A "MAT" ACTION! The 2016-17 high school basketball season is rounding the corner into the homestretch. In any sport, this time is a bittersweet one for senior players. Steve Sturgis recently caught up with the five senior basketball athletes at Wellington High School to pause and reminisce about their playing days, as well as to look ahead at what's to come. Hear what Will Long, Carson LeGrand, Therin Frame, Lauryn Snipes and Tayland French had to say by watching the full interview in the video below and on local cable channel 55.